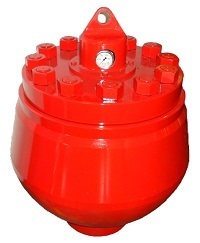 We offer a wide range of spherical pulsation dampeners for drilling operations. They are available from 1 gallon to 20 gallon capacities and in pressure ranges from 250 psi to 7500 psi. The body of our spherical pulsation dampeners is manufactured from a one piece steel forging, thereby eliminating the possibility of weld fatigue failure. The one piece spherical design allows for high efficiency in a small volume and does not require addition structural support..